Three groups of 40 UK students are paired one-on-one with Fayette County schoolchildren three days each week. The 120 schoolchildren visit classrooms and science labs, libraries and residence halls all over campus. An uncontested highlight of each semester is a brief visit to the residence halls housing UK athletes. “I remember the reaction of my ‘little buddy’ when we visited the dorm that houses our soccer players,” said Johnson, who is vice president of the UK volunteer organization. “He plays soccer, you see, and was totally amazed by the concept of attending college AND playing his favorite sport. And when one of the players explained that if he worked really hard, he might even win an athletic scholarship to attend college ... well, I thought he was going to just float away.” Johnson is a Pikeville, Kentucky, native and a biology senior who will be attending the UK College of Medicine next fall. The UK students do not tutor the children in academics; they are there for the children as encouraging older friends, not authority figures. “We try to show them the importance … and fun … of the college experience,” said Conrad, the UK group’s president and a Cincinnati native who will graduate this spring with a degree in psychology. “Most of our little buddies — that’s what the national organization calls our young friends — will be first generation students. The idea is to bring them to a college campus at a young age so that they will become comfortable with the atmosphere. They will have an idea of what to expect, they won’t be afraid of the college experience, and perhaps, they will be more likely to attend a college or university. “A side benefit for our buddies is that often their grades and behavior improves, making it more likely they will eventually attend college,” she said. College Mentors for Kids is a 20-year-old national nonprofit organization that pairs more than 2,000 first- through sixth-grade children with 2,300 college student mentors. College Mentors' signature mentor program has chapters on 33 college and university campuses in Indiana, Arizona, Illinois, Kentucky, Maryland, Missouri, Virginia, New York and Ohio. UK’s program is one of the fastest growing groups in the country. UK’s program, now in its fifth year, is funded completely by donations, which pay for transportation and the snack each child enjoys on campus. 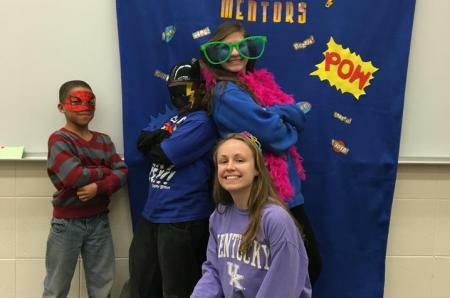 UK College Mentors for Kids’ annual budget is about $30,000 for transportation, food, insurance and supplies. Each mentor is responsible for raising $175 for their buddy’s experience. A first generation college student himself, Johnson said, “College changed my life, and now about 60 percent of my life revolves around College Mentors for Kids. It’s an impactful program that has made me a better person, improved UK, and changed the lives of dozens of kids. “At first, I didn’t have anyone I could talk to here at UK, ‘Mentors’ changed that. It gave me the voice of empowerment, a voice I have been able to pass on to the next generation,” Johnson said. Perhaps the most favorite activity for both age groups is the UK orientation activity. 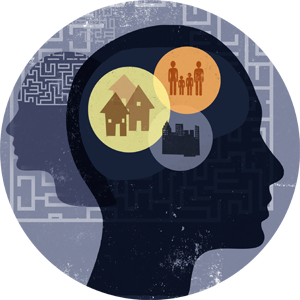 Every child is given a “major” and asked to research it, and then to talk with their mentors about their field of study. After the youngsters have collected their information and researched the buildings that their classes would be in, their mentors take them on a campus tour, pointing out where all their classes would be. “I distinctly remember the kids being in awe that we have class in such big rooms and with so many other students. They were full of questions and couldn’t get enough of seeing campus,” Conrad said. “It was after that activity that I overheard so many of our little buddies discussing what they wanted to major in when they come to UK in the future. 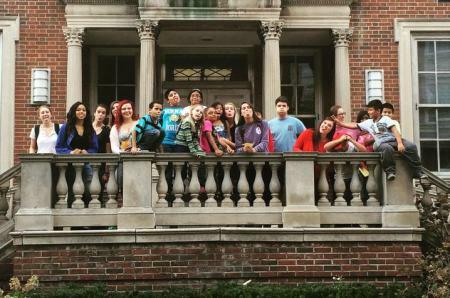 They were soaking in as much inspiration and information that they could in the hour they were exploring campus. I remember one little buddy running up to me with such excitement to tell me what he wanted to be when he grows up.